I was once in an optical metrology lab for an optical fabricator, where the large aperture Fizeau interferometers—hooded and occupying great big vibration isolation tables—were scheduled to take surface quality measurements of some custom optics that were being prepared for a customer. I was there on a photography assignment and had camera equipment and fluorescent lighting. The lab manager fretted and asked how long I’d be—not because he needed to use the equipment right away, but because my body heat and the heat of my camera equipment were likely to alter the lab temperature by some fraction of a degree. And that meant he had to move back his measurements for several hours to let the system and optic equilibrate in temperature again. He was going to lose half a day—after I left! Leaving aside the inconvenience I caused the manager in scheduling his day, I was shaken by the sheer cost to the whole plant’s operation, of waiting hours and hours simply to let a temperature stabilize well enough to measure an optic. Concerns like this are why it’s important to be able to measure fast and well, when the time comes. 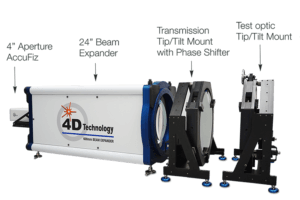 4D Technology’s new large aperture Fizeau interferometer is better suited to repeatable measurements on a production schedule. And that translates into better precision, with reduced wait times. The rigid, monolithic design make it easy to install and move, because you don’t have to dismantle the structure—you just pick up the lightweight beam expander and move it to where you want it. Sure, that presents another problem: realigning the optics in the system to the interferometry engine. But that’s been taken care of too. All the beam-expander’s optics are on-axis, without fold mirrors, minimizing retrace errors and maximizing data quality. 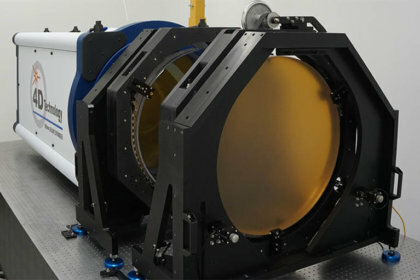 The interferometer attaches to the beam expander with a kinematic mount, so customers can remove the interferometer, using it for smaller aperture, full-resolution measurements, and then put it back without realignment issues. It makes the entire system more convenient, and saves money and time. 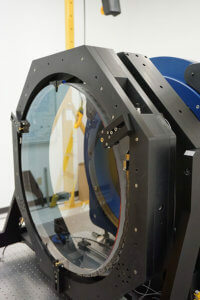 Phase shifting optics, with low force rotatable mounts, and fiducials are part of improving performance and quality. Another frustration that operators experience is difficulty in finding the alignment indicators. The 4D AccuFiz instrument has a separate, high-power alignment laser to assure quick alignment. The cavity quality is easy to maintain: an autofocus capability ensures users have maximum frequency response in their measurements. The flats are held in place using a low-force mechanism to ensure the best cavity quality. (See our standard interferometer accessories.) The transmission flat readily rotates for 3-flat tests, increasing the overall accuracy of the system. And physical phase-shifting means no recalibration is needed as the cavity changes. New 64-bit software has been written for 4D Technology’s interferometers, increasing the display and analysis capabilities of high frame-rate cameras. The powerful analysis features the ability to enter PSD pass/fail specification curves, resulting in instant good/bad disposition determination. Within the software, a function calculates the system frequency response, or ITF, ensuring the highest-quality data is consistently obtained. The new 24” aperture interferometer includes a high-resolution camera, making for superior frequency response in the measurement results. And 4D’s proprietary SIS module allows measurement of plane-parallel optics without having to coat the backside surface, or the need to use noise-prone mathematical data filtering techniques. You get clean, clear data. 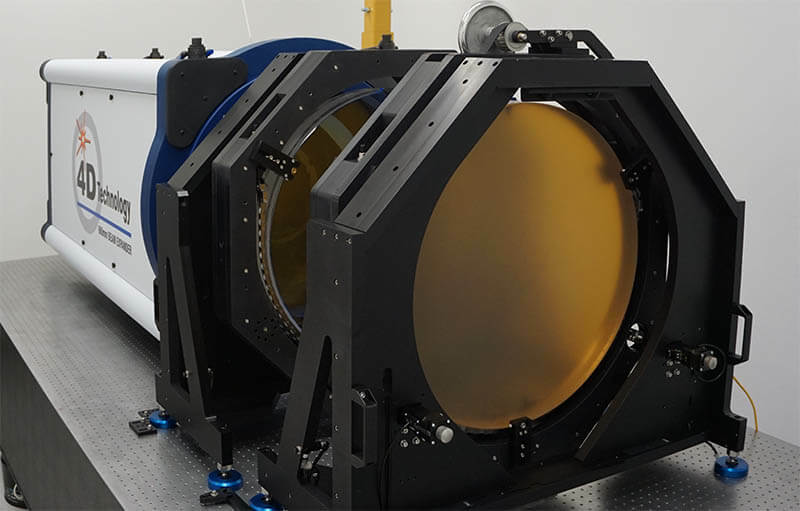 Part of the effort going into the large aperture interferometer redesign was to make sure the whole range of large apertures we offered—from 12” to 36”—obtains good results. In fact, the whole system was designed to make the measurement of large optics quicker, more repeatable, with better precision, and with less burden on the operators. In short, it was designed for efficient, precise measurements of large optics in shops that need to ship finished optics—and not wait for the lab.